An article from Midi Madagasikara notes that only 37 cases of meningoencephalitis have been seen at Ravoahangy Hospital. But what neither article mentions is the amazing background story of a determined 18-year-old blogger named Diana Chamia who first raised awareness about Kamba's condition with her blog post “Help Me Help Them“. 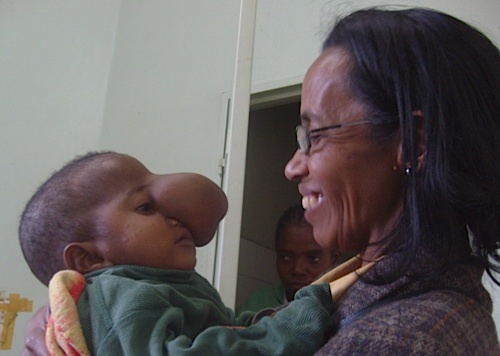 Diana Chamia pictured with Kamba prior to his operation, which was made possible largely to Diana's hard work. Diana, a young journalism student in Mahajanga, Madagascar, learned how to blog thanks to citizen media workshops organized by Rising Voices’ grantee, Foko Madagascar. Other Foko bloggers from Mahajanga include Cylnice, Jombilo, Lomelle, Mielmanja, Rondro, Tonkataly, Ysiastella, and Zouboon. Bloggers from the Foko Blog Club in Mahajanga, with Diana wearing all black in the middle. But it was Diana who decided to use her blog as a space for social action. As she describes in a blog post from April 19, Diana first met baby Kamba and his single mother, Philomène Georgine, after she missed her usual bus stop while lost in thought. I took bus number 5 from home to Bazar Mahabibo, but I was too dreamy or maybe it’s this kid’s destiny. I missed my stop. We were already at the City hall busstop when I realized my mistake. On the way back to the market, I saw this lady who was bearing a kid on her back, another in her arms and a big red bag on her shoulder. The one in her front was shielded with a green sari. (I was wondering why she used such protection in the very warm Majunga weather). A gust blew, revealing the child’s face. Diana goes on to describe her interaction with Philomène who, despite her best efforts, was not able to find support for the operation to remove the large growth from her son's forehead. That same day Diana promised herself that she would work to get Kamba the operation which would allow him to grow up an ordinary child without attracting the strange looks from passerby that his mother had already grown accustomed to. 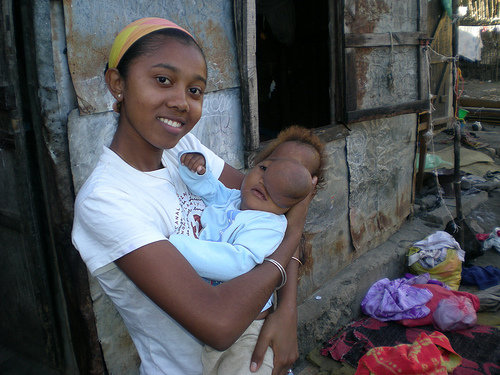 For the next few months Diana rallied her fellow Malagasy bloggers to help her cause. 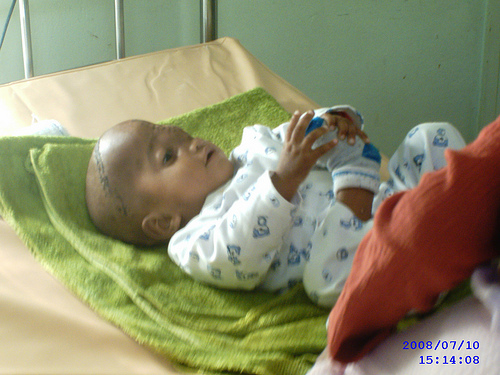 The entire Foko blogging project got behind the initiative and helped Diana set up Zaza sy Vavy Gasy (“For a Malagasy Woman and Child”), a bilingual site dedicated to raising support and funding for the costly operation to remove the growth on Kamba's forehead. A Facebook causes page was also set up. Diana's long campaign has been well documented by Foko project coordinator Joan Razafimaharo both on her personal blog and at the national blogging collective, Malagasy Miray. Meanwhile in Canada, Jean Razafindambo, a Malagasy expat with strong roots in Mahajanga, was surfing the internet on the day his grandson was born when he stumbled upon Diana's blog. As Razafindambo told the Ottawa Citizen, “I thought about my grandson, he was healthy, and if (Kamba) was my grandson, what would I do?” With the help of friends, co-workers and generous strangers, Jean and his wife Baku raised nearly $1,500 for Kamba's operation by running in Ottawa's half marathon in May. As you can see in the above photo, baby Kamba is recovering remarkably given that it was such a serious operation (lasting more than 8 hours). That operation would have never taken place if it were not for Diana's big heart and stubborn persistence. How many times have we passed by an individual in need of help and blamed our government for a lack of decent healthcare or public housing? But then we walk on. Diana didn't walk on. Armed with nothing more than a blog and her determination, she forever changed the life of a baby boy who has become known around the world as Baby Kamba. You can hear directly from Kamba's mother Philomène and from Diana herself in the following video with English subtitles. Wow. Unbelievable story, and amazing that Diana accomplished what she did by blogging! Thank you so much Diana and dear Foko Folks for sharing this piece – such an inspiration, it shows that everyone can make this a better world. Her spirit and energy have touched everyone and mostly all the FBC kids who now feel very inspired by her work . Read this story last night, and still can’t shake it out of my head. Diana is the perfect example of someone courageous enough to take a step from reaction to action, and making the difference many of us just talk or think about. Thank you Diana, you are a true inspiration. Thanks Diana. Now, all around the word can see tha when Malagasy want, Malagasy can. and blogging is one way to find out how life is very very important for us (bloggers). This is such an inspiring story! Kind hearts + the power of blogging = everyday miracles! Such a beautiful story. Go FOKO!